How To Win a Better Contract? UFT members from around the city have contacted MORE, saying that they and their entire chapters are planning to vote no. They believe our union can do better. They are right. To win the kinds of changes we all really want, however, our union will have to lead a much bigger fight. 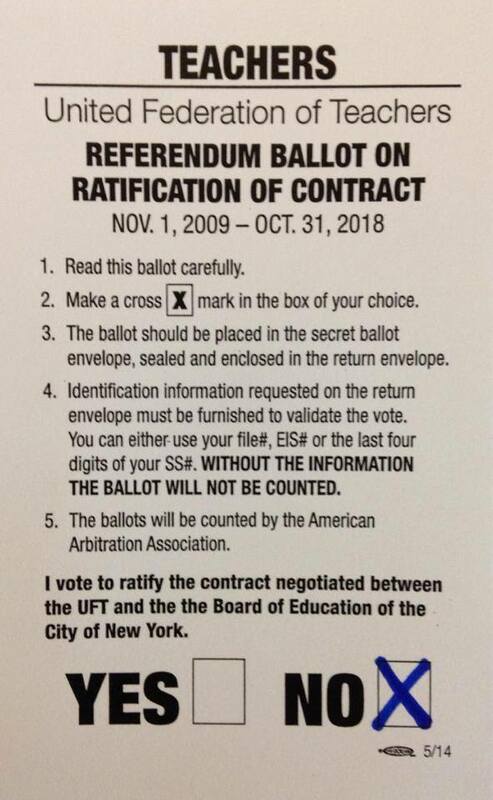 Peter Lamphere’s must read piece demonstrates that the money is there for a better deal and that if we reject the current offer, both UFT President Michael Mulgrew and Mayor Bill DeBlasio will be under political pressure to resolve this quickly and try to come up with an agreement the members are more likely to ratify. Furthermore, when members rejected a proposed contract in 1995, we wound up with a better deal in 1996. Voting down this contract proposal may be enough to get us some small improvements over what the UFT leadership just negotiated. But that is setting our sights too low: we deserve fair raises, an end to test-driven education, and a fairer evaluation system. ATRs deserve full citizenship. To win these, our union will have to mobilize our members with street protests and job actions to put pressure on the city and force them to negotiate better terms. So far, the Mulgrew leadership has been unwilling to do that. Instead, UFT leaders relied on a single strategy: from 2009 through 2013 they waited for Michael Bloomberg’s mayoralty to end. The hope was that a new mayor would be friendlier to public schools and to the UFT and would be willing to bargain in good faith. After four and one half years of waiting, New York City elected the most liberal, pro-labor mayor since the second world war. Yet the only payoff for us was a wage package that does not keep up with inflation and defers our raises and back pay for several years without interest. The sides could have agreed to lobby Albany to end the use of standardized tests to evaluate teachers. They could have chosen to place all ATRs in regular positions. They could have made some progress on class size. They could have guaranteed that all schools would have full support services. But they didn’t. Clearly, the strategy of waiting for a better mayor was a failure. Admittedly, our union can’t transform itself over night. In many schools, administrative prerogative reigns and many union members either don’t know their rights or are afraid to enforce them. In a climate of fear and disorganization, it would be difficult for any union leadership to launch the kinds of mobilization that would be necessary to win a good contract. Members who are isolated and afraid are less likely have confidence in their union. But, fortunately, it can be done. In 2012, after months of preparation and membership organizing the Chicago Teachers Union went on strike and successfully fought off some serious attacks on their members. They showed that when a union acts like a union it can win. After this vote is over, the union needs to change course. Our union should lead us in rallies in each borough to mount a pressure campaign for a good contract. We also need organization at the school and district level. The UFT should help union activists organize each other to defend their rights within their schools. Beyond that we need an action plan that will bring members of different schools together so that we can learn from each other and find ways to help each other organize. That’s what a union does. We hope the current UFT leaders will learn this. But we in MORE are not waiting. We have been meeting UFT activists in various neighborhoods to help strategize ways of rebuilding their chapter and reviving union solidarity. If you would like to meet with us, please contact us at more@morecaucusnyc.org or through our website morecaucusnyc.org. Together we can build the kind of union that can win the contract we deserve. 13 responses to How To Win a Better Contract? 13% salary increase over the last 3 years. 13% salary increase over tye last 3 years. While the top salary step did go down from 25 years to 22 years (yes, a very big deal), I fail to see how members got a better deal the second time around. This shows that MORES views are purely based on going against the unions current leadership at any cost! Hopefully, there are to many educators that see right through their crooked political agenda. Have they ever once agreed to anything the Union has done in the last five years? Of course not because they ran against Mulgrew! So why would they acknowledge anything good that’s he’s done? Not having the 25 year longevity also helped many teachers still get thousands of dollars each year. It must have been a big deal for the rank and file if there were able to vote it down. Waiting to reach longevity at 25 was not what the members wanted. Just imagine if it had been ratified, that 25 year longevity step would be a thorn in your side. So at times a vote of no is the step to ensure what’s best for the rank and file. Didn’t you watch the Q and A yesterday? Mulgrew announced the UFT victory on the lesson plan arbitration while he was addressing the educational changes in the contract. Educational issues are addressed in this contract. As you know the Evaluation system is changed to where we are only evaluated in 8 components with the elimination on Artifacts. There is a clause for paperwork reduction. Single session teachers day is re configured to give them more time to get the paperwork done at work during the school day. There is retro for persession work. According to our proposed contract, the DOE must give content teachers curriculum, if not we have the right to grieve. ATR’s are given as much full citizenship as possible. The DOE will pay for ATR’s for a year if the school is unable to do it. ATR’s as our chancellor said should be filling these vacancies. We are given an extremely fair raise that is to be paid our over time. We receive full retro with our increase. Nothing is perfect but there is not one give back in this contract, if you listened to Mulgrew yesterday during the Q and A you would have heard why we have to wait to get our retro. The city doesn’t have the money for all of us. Im actually glad it’s being paid out over time, I’m ensured that I get all my money and I know every other Union will get their raises too! Sounds like a good contract to me, I’m Voting Yes! One more thing about the ATR’s. Even though ATR’s are paid for by the DOE to fill vacancies, they are still employed by the DOE and cannot be laid off for not finding a position. You fail to ever mention the fact that ATR’s have always existed and will always exist if for budgetary reasons there is an excess. But the ATRs became a problem when Bloomberg tried to use them as a bargaining chip. How come you never mention in your blogs that Mulgrew and the UFT saved ATR’s from layoffs, and have continued to ensure they fill the vacancies? Sorry, but ATRs are a product of the awful 2005 contract Weingarten negotiated, which ended seniority transfers. Now, with this contract, in addition to a ten year, no interest loan to the city, the UFT leadership has helped create a streamlined process for getting rid of ATRs, which every single teacher in NYC has the potential to become. Vote for yourself; vote NO. I really do not understand some of the complaints. ATRs are protected better than they were – and I suspect that within the year Chancellor Farina will be eliminating this stupid time drain. working conditions, collection of meaningless data, etc. are addressed. I was here in ’95 and I did vote the first contract down and quite frankly it was a bad contract. The one that was ratified had almost no improvements over the first. The current contract is different because it is a very good contract. There are no givebacks. We are getting all our retro money compounded, something that many people said we couldn’t get. The raises are 18% over 9 years, not 10 that I have seen people state and compounded it means 19.5% in real dollars. People have to realize we have already done 5 years of this contract so all that money in raises will be coming in over the next 4 years. Don’t know about you, but I’m looking forward to a $20,000 raise over the next 4 years. In terms of ATR’s, this contract gives them a chance to get back into the classroom where they belong. The most senior ones will have their salary paid for by the DOE as opposed to having a principal cough up the difference between a senior teacher and the District average. They will also have full due process rights. They cannot be fired at will. In terms of CTU, I do like Karen Lewis, however was has happened since the strike? 50 Public schools have been shut down and replaced by Charter Schools and now the legislature is going after their pensions. The strike might not have been the resounding victory people think it is. Given the times and the Country’s anti-union mentality this is a great contract and only a fool would vote against it. As I stated in a previous blog, this ongoing argument stuns me. I am surprised that the illusion of smoke and mirrors created by this particular caucus is working on some educators across the city. It seems pretty simple, the Vote No members either have blinders on or they have a separate political agenda. Has anyone been following education across the country? Have any of you been following union patterns across the country? This is NOT 1995 and as some of my colleagues stated above we did not WIN a better contract through voting it down. To turn down this deal would be shooting ourselves in the foot. This is not a “Vote No” and live happily ever after situation. We’ll be thrown to the back of the line, 150 municipal unions later, with a lesser deal and GIVEBACKS. Let’s be realistic, we’ll probably never see a deal like this again. I have reviewed it with many of my members and they also agree that this deal provides educators with more protections and educational respect. Leading members to Vote No because of personal political agendas is wrong. …we are still waiting for him to do something positive….this is his first contract, and he’s caving in…Everyone has seen these poor ATR’s rotated in and out of our buildings, and we treat them like homeless people….ignoring them, and secretly saying,” I’m glad that’s not me.” Well, guess what, people??? They are us, and we are them. We can do better, and a little arbitration after a five year stick in the eye is a vote for future respect for our union. Vote No.